Climate Skeptic Article Inflation: Wattsupwiththat? Who's Responsible for High Gas Prices? Every person in the world should be concerned about the effect of global warming on the world’s food supply. A good place to begin addressing the issue in the U.S. Congress. Congressman Lucas represents the 3rd district in Oklahoma and is Chairman of the Agricultural Committee. 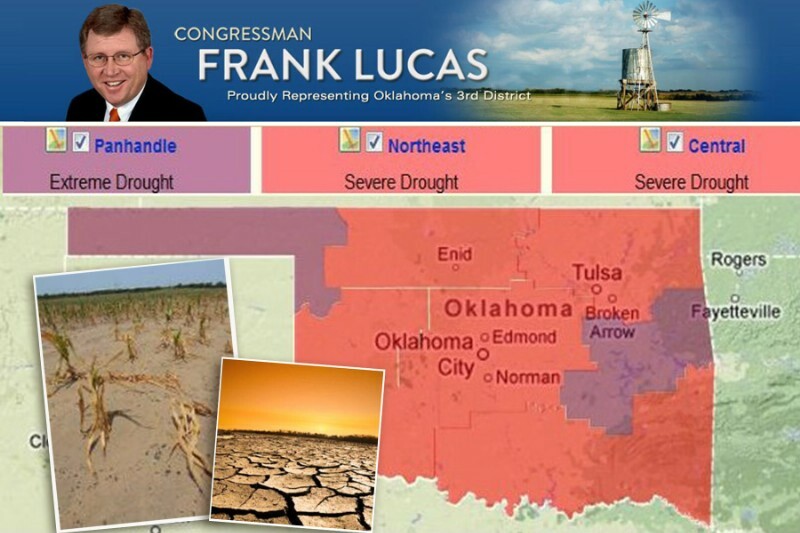 This summer, his district and the entire state of Oklahoma was under severe to extreme drought conditions. But it wasn’t just Oklahoma, 65% of the United States and many of the lands of the Earth where food is grown were also experiencing drought. Food shortages abroad can pose humanitarian crises and national security concerns. Congressman Lucas has a responsibility to his district, to the United States, and to the world to protect our food supply. If you agree, then please sign the petition . Congressman Lucas’ campaign ads point out he is trying to keep food prices affordable by opposing government regulation on the size of chicken cages. However, climate change is a much greater threat to food prices and to our food supply. Recent research has shown a direct link between climate change and the heat waves and droughts that we have been experiencing. Some may argue that more CO2 is better for plants, but no one doubts that extreme temperatures and droughts are devastating to the world’s food supply. A graph at the bottom of the article projects the worldwide damage to food production. As food production has fallen, shortages are beginning to occur, and prices are rising for food and animal feed. If you are worried about food prices, then please sign the petition. Congressman Frank Lucas was asked at his town hall meeting if he would lead the Agriculture Committee in an investigation of the effect of climate change on our food supply. He said he would consider it, but over a year has passed and no investigation has been undertaken. Besides food prices, climate change will affect the availability of water and food in many parts of the world, particularly those most prone to drought and famine. In this century, water shortages, food shortages, and poverty related nutritional deficiencies will affect close to a billion people globally. We must start now to mitigate the effects of climate change in this century – and the Agricultural Committee is the most important place to start. One voice may be ignored, but a million requests will be heard. Please ask Congressman Lucas to investigate the effect of climate change on our food supply by signing the petition. This entry was posted on Friday, September 7th, 2012 at 9:37 am	and is filed under Climate Change. You can follow any responses to this entry through the RSS 2.0 feed. You can leave a response, or trackback from your own site.